It's not the prettiest thing you'll ever see, but in its day it got the job done. One of the first predators to walk on land, this creature - Palaeocharinus of the extinct Order Trigonotarbida - has been extinct since the dinosaurs first walked the land. But in its day, it was the big dog. This was the guy who ate all the little fry. Everyone ran in fear when this guy walked by. The scientists used Blender to create the animation. 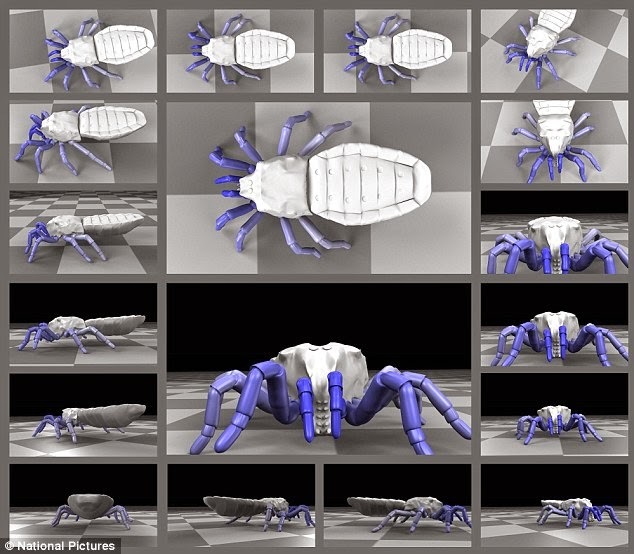 Pictured here are a sequence of images from the video showing how the arachnid walked. 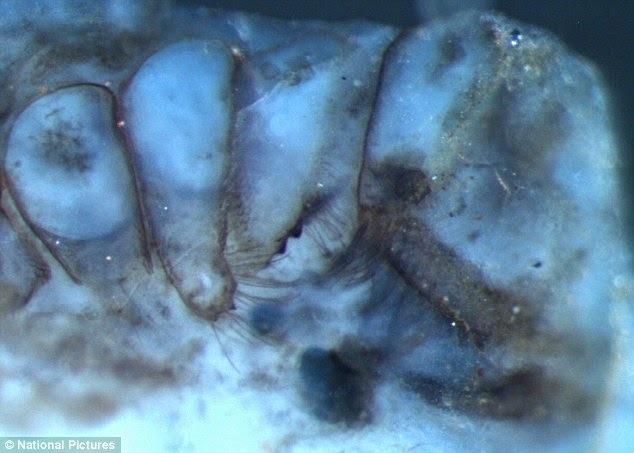 Since they found the bone joints and all the hardware that the scuttling little creature used, the scientists could compare the creature's legs to those of modern spiders and see how they would have walked. Apparently, this was the first way that anything walked on the earth - it certainly wasn't anything on two legs, or even four. Eight-legged freaks! The earliest walking creatures that we know of used eight legs to walk, and this is what they looked like, though there was nothing else around to see them. If you think there are too many spiders around now, well, back then, with no predators, these little critters would have been everywhere. A walk in the forest would have had them all around you, behind every rock. They were more numerous than present-day spiders. The fossils were found in the Rhynie Chert, a formation where silica-laden water bubbled up from volcanic hot springs, instantly petrifying lichen, plants and primitive insects in stunning detail. Probably not so great for them - like getting instantly freeze-dried - but awesome for present-day scientist who find these excellently preserved specimens. It's kind of odd to think that, if the dinosaurs had been scientists investigating the earth's past, these little things already would have been exactly were we found them, in the exact same condition. The only difference would have been that instead of being 300 million years old, the fossils would have been 150 million years old. These were ancient fossils when Tyrannosaurus Rex stalked the earth and have not changed since then. Spiders thus were around long before us, and no doubt they will be around long after us. They are the defining creature of planet earth. Who has dominated planet earth since its earliest days, lived there continuously, and are its true endemic inhabitants through time?